As promised here is the link for the Ebook Version for "Walking with a Cane"
Anyone with an Ebook Reader Should be able to access/purchase your book without any problem. NEW YORK The Big Apple is full of luxury and riches as it is home to many wealthy inhabitants. 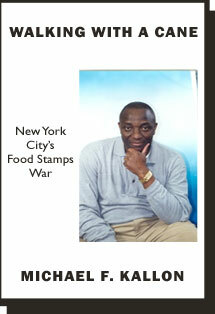 In Michael F. Kallon new novel, Walking With a Cane: New York City Food Stamps War (now available through AuthorHouse), he exposes the city dichotomy of wealth and despair by giving a voice to the desperate poor. At the close of the 20th century, the mayor of New York introduces a new workfare program leaving the poor cut off from food stamps. The program employs the largest number of untrained sanitation workers in the history of the city. A parade of sick men and women, mothers with children and homeless march to the government agencies putting innocent social workers at the front lines of a social war. The administration decision to deny assistance deprives the poor of the basic human right of food. The main character, Zombo, representing the author, has been disabled by a spinal injury inflicted by medical treatment. His struggle to survive in New York heightens his awareness of the dismal situation of numerous city residents. He decides to document the horrific events that send sick people back to work and leave the poor striving to make ends meet by battling obstacles upheld by legislation, doctors, human resource administrators and judges. Walking With a Cane is a sincere look at the struggling poor of New York and the true effects of changing city policy. Kallon is a native of Sierra Leone on Africa west coast. He moved to the United States after escaping war in Liberia and Sierra Leone. He attended Catholic schools in Sierra Leone and obtained an associate degree in education from Kakata Teachers Training College in Kakata, Liberia. In the United States he received a bachelor degree in writing and literature form Burlington College and a diploma for freelance writing from Harcourt Higher Learning in Scranton, Pa. He has written many works on KISSI culture in Africa and also life in the United States. He previously published Idols With Tears (available through AuthorHouse). Published by the "The Sierra Leonean Writers Series (SLWS); and could be purchased on AMAZON and on lots of other international outlets. ARVERNE, N.Y. Before the footmen of the modern world sliced through the thick jungles of Africa, it flourished unspoiled. However, since imperialism has stripped much of the old ways, many cultures have been nearly lost. 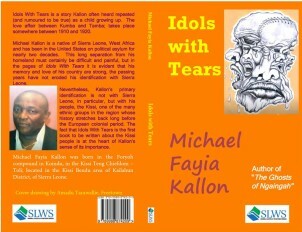 Michael F. Kallon revisits the Kissi tribe and its ways in a revealing new novel, Idols with Tears (now available through AuthorHouse). According to Kallon, the Kissi people were tribes that populated the areas of West Africa that are known today as Sierra Leone, Liberia and French-Guinea. His book takes place before the arrival of the foreigners who brought Christianity and Islam in tow. Set deep in the jungles of Sierra Leone, the novel tells the tale of Tamba Kolloh and his love for the late chief priest daughter, Kumba Mongor. When the ghost of Nyuma Mongor mysteriously chooses Tamba to be the next chief priest of the village of Yilandu, he must bear the immense responsibility without losing his love. Born in Koindu, a prominent business center in the Kissi Chiefdom located in Eastern Sierra Leone, Kallon was educated at Christian schools in Sierra Leone and Liberia. He sought further education in America. He graduated as a private investigator from the Detective Training Institute in California and earned a degree in creative writing and literature from Burlington College. He also worked as a freelance writer. Kallon has lived in New York since he escaped the human slaughter that plagued Liberia and Sierra Leone in the 1980s and 90s. Idols with Tears is his first novel. 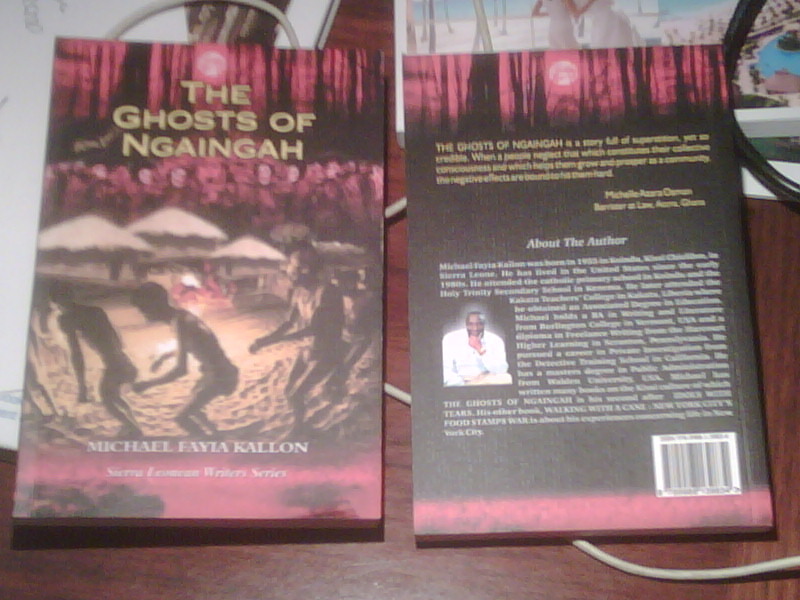 The Ghosts of Ngaingah is about a village located in the Kissi-Kama Chiefdom in the northeastern region of the Republic of Sierra Leone on Africas west coast, and a ritual curse that befell it. The Kissi have lived in that village since ancient times. Upon their refusal to follow ancient traditional practices at the local oracle near the Kuyoh Mountain, and at a shrine on the bank of Ndopie River, they heard a mysterious dirge one morning, before the sun reached its zenith. The villagers saw a crowd of ghosts with bundles on their heads, and accompanied by lots of animals. They were repeatedly chanting a mysterious dirge. The ghosts entered crevices in the Kuyoh Mountain and disappeared. The scratches they left on the hard rocks are still visible. According to my mother, who was a young woman when the incident took place, it probably happened in the mid 1940s. This narrative, which contains humor, mischief and magic demonstrates how powerfully tradition and custom influenced the lives of the people of one ethnic group -- the Kissi. The mystery of the singing ghosts still haunts them and. I am telling the story so readers may know about one of the Twentieth Century enduring mysteries.Some names in this work are fictitious, excluding the famous Paramount Chief Ansumana Jabba, alias Memah of Kissi-Kama Chiefdom, who lived at Dia, and that of Chief Sombo, who actually lived in Ngaingah during that time;, nevertheless what you are about to read is an eyewitness account of what occurred in that Kissi village. Today, when security is not just an empty buzzword, those who work in the security field are often overlooked as important contributors to the safety and security of those they are hired to protect. In Michael Fayia Kallon's The Traffic Supervisor At JFK, he sheds considerable light on the plight of security officers, in particular, at JFK, the country's largest international airport. Not only are these officers underpaid, they are also subjected on a regular basis to the taunts and angry outbursts of a prejudiced, belligerent supervisor who denies them breaks for meals and restroom use. There is, to be sure, some humor involved in some of the incidents, and the repetition of daily activities gives the reader a realistic look at the problems of not only hiring supervisors with cognitive skills but also paying attention to officers who have serious complaints about their supervisors. In either case, the welfare, safety, and security of everyone in their sphere of influence are jeopardized. The Kissi are natives found in Sierra Leone, Liberia, and French-Guinea on the west coast of Africa. 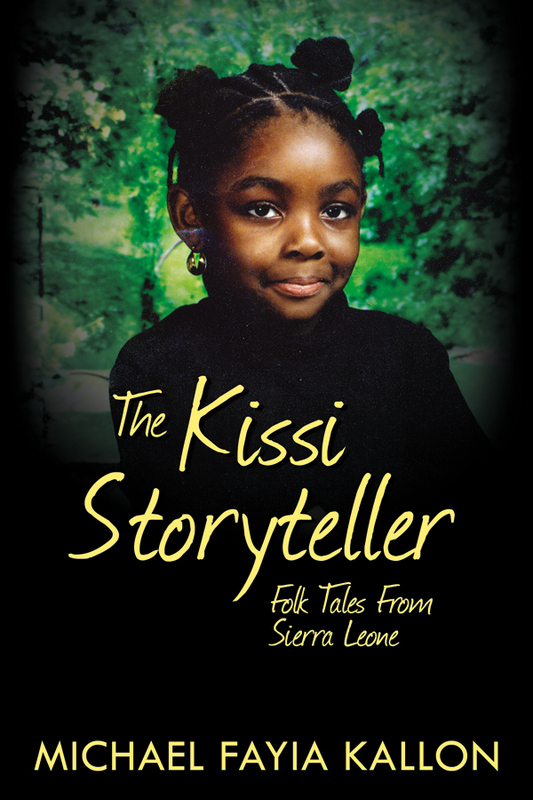 The stories narrated in this book do not just embellish the truth about the virtues of the culture of these unique, mysterious, and enigmatic natives; they portray an ebullient mythology of the Kissi in Sierra Leone. Kissi Tongi in Sierra Leone and along the banks of the Makona River. Fayiah A. Kabakole is one of the prominent Kissi men I have known over the years. His dynamic work as director of the Kissi programs and as announcer at ELWA Radio in Monrovia, Liberia in the good old days demonstrated his competence and shrewd eloquence. This helped to propagate the Kissi image in the world. Before the civil war in Liberia, Mr. Kabakole's voice at ELWA Radio invited old and young people of all walks of life in the Kissi chiefdoms in Liberia, Sierra Leone, Guinea, and beyond. They anxiously sat near a radio, enjoying the evening zephyrs, as they listened to this marvelous Kissi radio announcer, Fayia Kabaa, as he was popularly known in those days. Furthermore, his listeners benefited immensely from his lectures on Christian principles, Kissi culture, and the ebullient stories he narrated. Even the Kissi farmers and other laborers after working all day long; hurried home at dusk to their towns and villages to listen to Fayia Kabaa. With his bell-like resonant voice, he fed his listeners good Christian principles and the virtues of life. He narrated thought-provoking stories that lulled the tastes of his listeners. All of his stories ended in idiomatic Kissi expressions which were also colored with strange jargon for his listeners to elucidate. Moreover, in his absence from Kissi land, all good memories of such traditional Kissi storytelling, jargon, and virtues of good Christian living still revisit the Kissi and other listeners of old, and those who have returned to their war-torn towns and villages in Liberia and Sierra Leone after the blood-curdling carnage that ravaged the two countries in the 1980s and 1990s. Today, Mr. Kabakole lives with his family in Philadelphia, Pennsylvania/USA where he immigrated at the peak of the hostilities in Liberia. 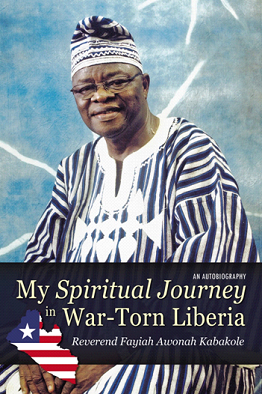 It was indeed a privilege that I was able to give a helping hand to this great project, "MY SPIRITUAL JOURNEY IN WAR-TORN LIBERIA," through the auspices of the Makona Book Club, Inc. It is a gift to a man who first loved his kinsmen - the - Kissi, and in return, we love him too. Bravo, Mr. Kabakole! May there be many more stories to come. Michael Fayia Kallon, Author/Founder, Makona Book Club, Inc..
HOW TO PURCHASE A COPY?